In 1960, on a summer day in Cuernavaca, Mexico, Harvard psychology professor Timothy Leary and several friends ingested a bowlful of psilocybin mushrooms, an experience that Leary later described as “the deepest religious experience of my life.” Upon returning to Harvard, Leary and his associate, Richard Alpert, immediately formed the “Harvard Psilocybin Project”, later known as the “Harvard Psychedelic Club”, with the intent to survey the psilocybin experiences of graduate students and faculty members in the Boston area. When the researchers denied participation to the curious undergraduate Andrew Weil, he published an exposé in the school newspaper about the club. The article ultimately sent Leary and Alpert packing, but more importantly, it introduced psilocybin to the general American public (Lattin 2010). The active ingredient that Leary ingested that summer day was the hallucinogen psilocybin, a chemical that eventually rose to fame in the 1960s in both the scientific and recreational world. Psilocybin’s ubiquity allowed it to exert a powerful influence. While it is now listed as a banned drug for recreational use, psilocybin compounds remain a fascination in the fields of mycology and psychology (Tylš 2013). Psilocybin usage can actually be traced back to rituals performed thousands of years ago, in places such as Mexico and New Guinea (Tylš 2013; Guzmán 1998). Their widespread use was partly due to the extensive native habitats of the psilocybin fungi. In the grand scheme of classification, psilocybin mushrooms are a subset of neurotropic fungi, which are fungi that have chemical compounds with a special affinitiy for neural tissues (Guzmán 1998). Neurotropic fungi include not only psilocybin-containing fungi, but also fungi that contain neurotropic chemicals like ibotenic acid (found in some amanita species) and ergotamine (found in ergot fungi) (Guzmán 1998). For the most part, psilocybin-containing fungi occur in the greatest numbers. They are mostly concentrated within the Psilocybe genus, which contains 116 species of hallucinogenic fungi (Guzmán 1998). Neurotropic fungi have been identified as far north as Alaska and Siberia, and as far south as Chile and New Zealand. Psilocybin is produced throughout the psilocybin mushroom, particularly in the carpophores (fruiting body) and mycelia (hair-like structures that make up the thallus, or main body, of the fungi)(Leung 1965). The concentration of psilocybin in a mushroom may range from 0.2% to 1% of its total dry weight (Tylš 2013). Although it is not clear why Psilocybe fungi produce this hallucinogen, theories have been devised that attempt to explain this enigma. For instance, several species of the Psilocybe genus, like the most common psychoactive fungi P. semilanceat, have been reported to have antimicrobial properties (Ranadive 2013). It is possible that psilocybin contributes to these antimicrobial properties. Psilocybin could also just be a by-product of metabolism, serving no function. 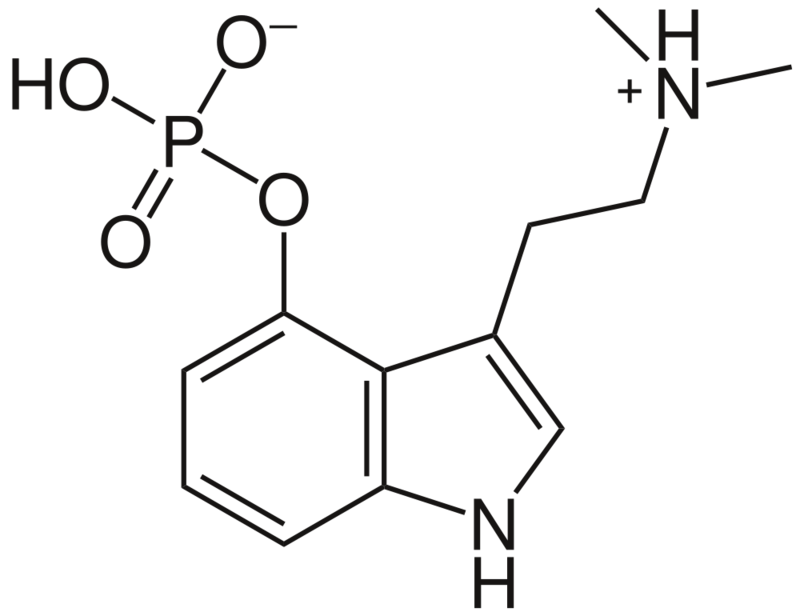 Psilocybin (O-phosphoryl-4-hydroxy-N,N-dimethyltryptamine) is a psychoactive hallucinogen, but the molecule responsible for the mental effects is its metabolized form, psilocin (Tylš 2013). A hallucinogen is a substance that induces distortion of cognitive processes, including changes in perception and disposition (Nichols 2004). Generally, hallucinogens are relatively safe physiologically, and do not induce dependence (Nichols 2004). Psilocybin is water-soluble, whereas psilocin is lipid-soluble, which may explain its lasting effect (Tylš 2013). The molecular structure of psilocybin is a potent hallucinogen, which is responsible for its mental effects. Photo courtesy of Wikimedia Commons. When psilocybin is ingested, it is quickly metabolized and dephosphorylated into psilocin within the intestinal mucous membrane by alkaline phosphatase, an enzyme (Tylš 2013). When tested in animals, psilocin was detected in several parts of the brain, including the neocortex, hippocampus, and extrapyramidal motor system, as well as the kidneys and liver (Tylš 2013). In the brain, psilocin had a strong affinity to serotonin 5HT receptors, eliciting symptoms often associated with the hormone serotonin, which is well known for its anti-depressive effects (Tylš 2013; Passie 2002; Neumeister 2002). At high enough doses, psilocin may elicit symptoms of altered perceptions, which include confusion, disorientation, hyperactivity, and staring into empty spaces (Tylš 2013; Berger 2005). After its widespread use as a recreational drug, psilocybin was given the legal status of a schedule 1 drug in 1970 (Tylš 213). Nowadays, psilocybin is being reintroduced as a popular research topic because of its potential therapeutic value (Tylš 2013). Psilocybin also remains an important model for psychosis and schizophrenia, as it induces psychotic symptoms and may help us gain a more thorough understanding of brain activity in general (Tylš 213). Given today’s changing views on drug use in the medical and recreational world, it has become even more important to fully understanding this ancient yet fascinating drug. Lattin, Don. The Harvard Psychedelic Club: How Timothy Leary, Ram Dass, Huston Smith, and Andrew Weil Killed the Fifties and Ushered in a New Age for America. New York: HarperOne, 2010. Tylš, Filip, Tomáš Páleníček, and Jiří Horáček. “Psilocybin – Summary of Knowledge and New Perspectives.” European Neuropsychopharmacology (2013): n. pag. Guzmán, Gastón, John W. Allen, and Jochen Gartz. “A Worldwide Geographical Distribution of the Neurotropic Fungi, an Analysis and Discussion.” Ethnomycological Journals: Sacred Mushroom Studies 14 (1998): 189-280. Leung, Albert Y., A. H. Smith, and A. G. Paul. “Production of psilocybin in Psilocybe baeocystis saprophytic culture.” Journal of Pharmaceutical Sciences 54.11 (1965): 1576-579. Ranadive, Kiran R., Mugdha H. Belsare, Subhash S. Deokule, Neeta V. Jagtap, Harshada K. Jadhav, and Jitendra G. Vaidya. “Glimpses of Antimicrobial Activity of Fungi from World.” Journal on New Biological Reports 2.2 (2013): 142-62. Nichols, David E. “Hallucinogens.” Pharmacology & Therapeutics 101.2 (2004): 131-81. Passie, Torsten, Juergen Seifert, Udo Schneider, and Hinderk M. Emrich. “The Pharmacology of Psilocybin.” Addiction Biology 7.4 (2002): 357-64. Neumeister, A. “Tryptophan Depletion, Serotonin, and Depression: Where Do We Stand?” Psychopharmacology Bulletin 37.4 (2002): 99-115. Berger, Kyan J., and David A. Guss. “Mycotoxins Revisited: Part II.” The Journal of Emergency Medicine 28.2 (2005): 175-83.